IT'S AN ONION! Can you believe it! Looks like I've been deep-frying chrysanths again, doesn't it? 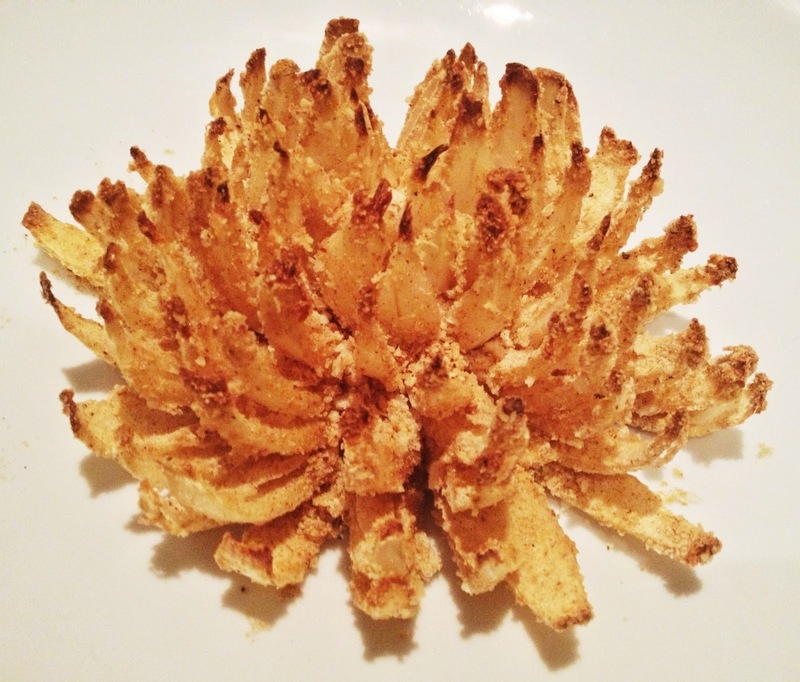 This, dear reader, is a Bloomin' Onion. Apparently they are a big deal in the States, where they are a popular restaurant appetiser, or as we say over here, starter. I had no idea they even existed until I was meandering through A Beautiful Mess the other day, and the lovely Emma had created one. Well, my mind was blown. OBVIOUSLY I immediately wanted to make one of my very own. I was so excited that I didn't really read Emma's recipe - I just studied her magical cutting technique, and then jumped straight into a bowlful of breadcrumbs (not literally, don't worry). I imagine my recipe is in no way authentic - for a start, I haven't deep-fried mine - oh no, no, no, DANGER! - and also I've just chucked in a blend of spices that I thought would taste good. Also: Parmesan, because a meal without cheese is like a day without sunshine. Americans, if I'm trampling all over your childhood culinary memories, I apologise. But hey - mine tastes great. TRY IT. Slice 1cm of the top of the onion. 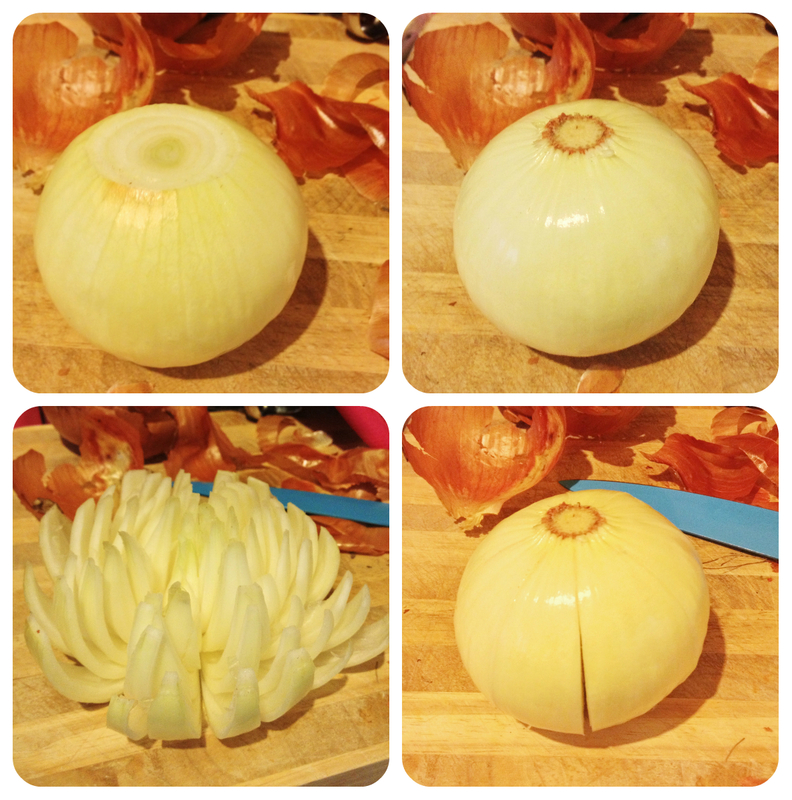 Peel the onion and trim the root section so that it's flat, but don't cut it off. Place the onion sliced end down on the chopping board. Starting about ½cm from the root, cut all the way down the onion. Repeat until you've sliced the onion into 16 sections (around 1cm wide), with the root still intact. Mix the dry ingredients and the Parmesan in a bowl. Using a pastry brush, brush beaten egg over the bottom layer of petals and sprinkle with the breadcrumb mixture. Repeat for each layer until the onion is covered in a crust. Remember to do the outside of the onion, too! Rebrush the tips of the petals with egg and dip into the breadcrumbs to make sure everything is well coated. Transfer to a baking tray, spritz with a little olive oil, and bake in the centre of the oven for 20-30 minutes, until the onion has turned golden and crispy, and the tips are just starting to catch. Serve with your choice of dip - I mixed equal parts mayonnaise and sweet chilli sauce, which was delish. Oh - and if you're feeling fancy, scoop out the centre petals before the egg and breadcrumbs stage, and use the hollow to stow your dip. Then rip off the petals one by one, dunk, and enjoy! OH WOW. I remember having this in Oklahoma and thinking it was delicious, but assumed that making my own would involve deep-frying (and third degree burns). Hooray! Yes, they're the main selling point (after steak) at the Outback Steakhouse chains. I remember them as being huge and covering an entire plate. But I haven't had one since I was in junior high. 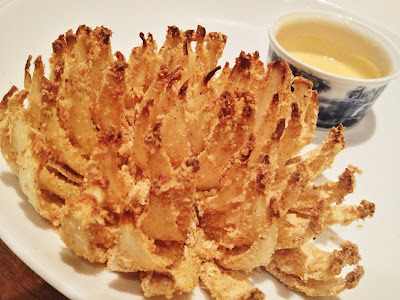 I remember watching an episode of Will & Grace where they featured heavily, but it was before the days of the internet so I had no idea what an onion blossom was. Damn tasty by the looks of it. These + Bacon Roses in a bouquet...! We really should offer gourmet bouquets as a service. Its sooooo pretty! I haven't seen one in AGES, and baked YES!